Good Luck Team GB at the WUSV ! The GSD League of Great Britain Working Dog Group wish our selected Team GB the very best of luck at the WUSV World Championships 2017 in the Netherlands! Good Luck Team GB at the FCI ! 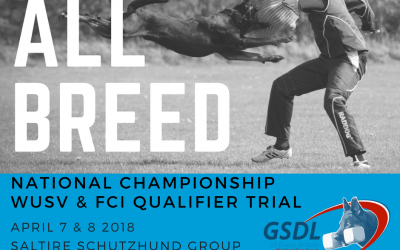 The GSD League of Great Britain Working Dog Group wish our selected Team GB the very best of luck at the FCI World Championships 2017 in Germany!